The second Castlevania to be released on the Nintendo DS, Portrait of Ruin, is a game that plays like the rest of the classic series, but with a few added twists and capabilities. It\'s got a lot of repetition in more ways than one, but definitely deserves a playthrough, because it\'s a ton of fun. Portrait of Ruin stars two heroes instead of one; Jonathan Morris and Charlotte Aulin. Unlike other Castlevania games, these two work side by side or on their own. Charlotte provides the brains with her knowledge of magic, while Jonathan is the brawn with a variety of physical abilities and a mastery of many different weapons. They\'ve come to investigate the reappearance of Dracula\'s Castle in a time of war and chaos. The obvious objective is to defeat Dracula, but to do that our heroes must deal with a middle man. Or in this case, middle vampire. One named Brauner has manipulated Dracula\'s castle through the use of cursed paintings, which provide another interesting twist to the series. While you must explore Dracula\'s castle and fight swarms of demons and monsters, you\'ll also come across a series of paintings in the castle, which transport you to other settings. Not only will you slay demons and zombies in a castle, but you\'ll also defeat evil clowns in a cursed circus, fight ghosts in a pyramid, and destroy giant bees in a dark school. For those who enjoy the challenge of gathering 100% of the map\'s data, Portrait of Ruin will provide several different areas to chart and explore. In some games having two heroes to control at the same time can be annoying, but not so in Portrait of Ruin...at least most of the time. 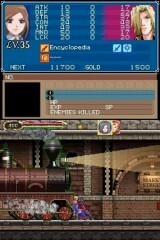 Both characters share the same stats, but can be equipped with different armor, weapons, and abilities. You can choose to play either character, and if you wish, switch mid-game to the other. However, the one you don\'t control can tend to have a mind of its own, which is helpful in general-purpose monster slaying, but not in some key moments such as boss fights and solving a few puzzles. If you can harmonize the duo just right, you\'ll be fine. If you can\'t control both, you\'ll have a difficult time with the game later on. The benefit of having two? You\'ll appreciate it most with their combination spells, which can take down bosses rather quickly (provided you have enough MP). 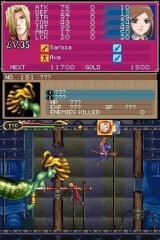 Aside from the basic game, Portrait of Ruin also puts the DS Wi-Fi feature to good use. Co-Op Mode and Shop Mode are just a few of the fun interactive things you can do with other players of Portrait of Ruin. Unfortunately, the touch screen doesn\'t see of lot of action. You can make selections with the stylus on game menus, but that\'s about the extent of it. It\'s much less of a hassle to just use the D-Pad, A and B buttons. The lack of touch isn\'t enough to kill the game though. Along with its new gameplay features, it has great graphics, a fitting soundtrack that won\'t grate on your ears, and a ton of fun extras that the diligent player will discover with a bit of detective work. You can get a good twelve to twenty hours of gameplay just on the first run alone, and that doesn\'t include the extra play modes you can unlock afterwards. Portrait of Ruin is already out, so if you\'ve been considering giving it a try, chances are you won\'t be disappointed.